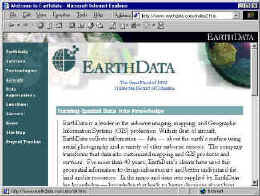 The image to the left was created as a splash screen for the new EarthData web site. It was created using various Photoshop and 3D application techniques. 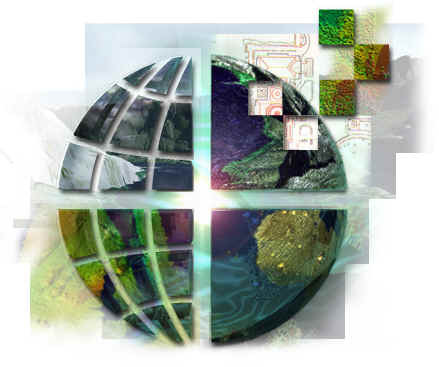 The rest of the site was designed structurally around Microsoft FrontPage 2000 with some minor edits in GoLive. Using frames as well as a combination of percentage and pixel based HTML attributes, the site was designed to adjust itself for different window sizes and retains backwards compatibility. The site also uses Front Page server extensions such that company personnel can easily edit text and add pages using online templates and without having to download the pages they want to edit. Using FrontPage 2000 as an HTML editor also allowed for easy WYSIWYG HTML editing and online synchronization between myself and the writers. The IIS and FP Server Extensions structure also allows for easy expansion and database driven ASP uses. A while after the site had been published to it's server domain, I gave a seminar to a number of corporate employees and writers that taught them how to properly maintain their website using FrontPage 2000. I showed them how to delegate tasks to other workgroup members, how to ad new pages, insert text and images, create links, manage broken links, and even create database links.